BRITISH confectionery company Sweetdreams Ltd has confirmed it will exhibit for the first time at ISM 2018. Representatives from its senior leadership team will appear at the conference from 28 – 31 January at Koelnmesse in Cologne to showcase the business, its range of products and manufacturing processes. In the last two years the company has experienced unprecedented growth due to new product development and increased discount sector penetration with its Choc Nibbles product range, as well as investing in state of the art panning and coating equipment to develop new products allowing exposure to new markets. Sweetdreams is now seeking export opportunities to further develop its sales and market penetration. ISM 2018 is an opportunity to present the company’s new management team. On the stand will be Matthew Stephenson (MD & owner), Mike Flower (Operations Director), Andy Baxendale (Technical Director) and Mark Robinson (non-executive) – arguably the best SME management team in chocolate confectionery in the UK. In the last 6 months, Sweetdreams Ltd has moved to a new 25,000sq ft factory, whilst also investing in a brand new coating and panning line. Housed in a purpose built unit allowing for controlled climate and humidity, Sweetdreams Ltd can offer customers unrivalled quality, innovation and service for all their coating and panning needs. Coatings include milk chocolate, plain chocolate, yoghurt, souring or similar and anything from fudge, fruits, seeds and sugar confectionery can be coated for bulk supply or inclusions. Sweetdreams prides itself in delivering bespoke confectionery products and is also on track to be BRC approved by early spring 2018. 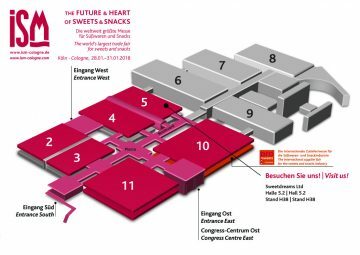 ISM 2018 is the world’s largest trade fair for sweets and snacks and focuses on new trends, perspectives and business contacts. From chocolate and confectionery, to biscuits, through to snack items, the ISM conference reflects the entire spectrum of products on the sweets and snacks market. Not least thanks to its high degree of internationality in terms of both its exhibitors and visitors, the event confirms its leading role in the industry year for year. Around 38,000 trade visitors and 1,647 exhibitors acquired a taste at the ISM 2017 event, and 2018 looks to build on that success.